Are you getting bad weather this week too? dropping from 75 yesterday to 30s in a couple of days. chance of snow tomorrow. 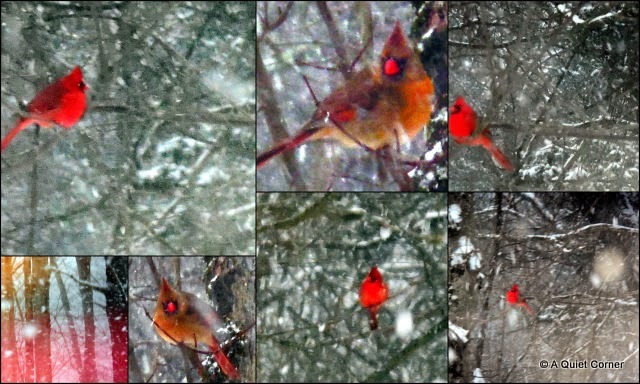 lovely cardinal shots...yes...we've had more snow today. We've had a bit but not much. Pretty darned mild here. You never know here in GA. It is nice now but Friday it may snow again. Darn we are getting a winter. Yes, we are heading for bad weather this week o what we down under consider bad weather. Days up around 100ºF but of course that is likely to happen as all the schools recommence their school year this coming week and it is always so HOT. I know snow and sleet can be dangerous but I sometimes wish we had just a wee share of it in Perth as the hot days get so tedious. Bad weather? Us? In California? :( No. ..sob.. I love your cardinal. We don't have them over here and I've never seen one for real. I'd love to. The last two days have actually been warmer. I love your Cardinal mosaic. They are beautiful birds. Have a happy Sunday! It has been unseasonably warm here but we are going to cool off to the low 60s for awhile, now if we could just get some rain. I gave up an checking the weather, it just makes me depressed.